We recently did a study that showed one painfully glaring reality. There are 12,000 fraternity/sorority PR chairs around North America serving chapters and councils this year, and most of them have never been trained how to do their job! And finally, when something bad happens say you’re sorry commit to fixing the problem and call for help. We’ve been historically TERRIBLE at this as an industry. We mostly try to cover our a$$. Don’t. Just say you’re sorry. Admit you screwed up. Find a way to fix it. Seriously. Call your HQ, Greek Advisor, or your council support system (i.e. NIC, NPC, NPHC, NAPA, MGC, etc.) — they are there to help you. I don’t have any idea what your experience is like right now – or what it’s like to be a fraternity man or fraternity leader in today’s world. But I know this: It’s hard. I believe it is harder than ever to be a fraternity man, especially to be a fraternity leader. I know there’s a lot of problems we you are facing that aren’t unique to fraternity but are amplified by the light shined on fraternity. I know there has to be so much you are dealing with, struggling with, coping with. I don’t want to ruin your fun. I don’t want to make fraternity boring. I don’t want to take away your identity, values, traditions. I want to help you. I want to help you make fraternity safer. I want to help you make fraternity a place where you can have fun, work hard, challenge each other, explore what it means to be a man, learn, grow, and make memories and friends that last your lifetime. I want to help make fraternity relevant to you. I can’t help but feel like you’re afraid to talk to us about what is really going on. Most of the conversations my colleagues and I have had with you in recent months seem guarded, like you might be choosing to say what you think we want to hear. It feels like lip service. It feels almost robotic - like you are intentionally saying all the right things on the surface – but the statements are hollow. I can see it in your eyes. I know there is more there. I see the pain, anxiety, stress, and denial you’re hiding. I don’t care how bad it is. I don’t care how dark the story is. I don’t care how deep the problems are. I want to hear it. I want to listen. I want to understand. I want to support you. I want you to disagree with my ideas. I want to hear yours. I want to understand your reality. I want to have a real – and honest conversation – no matter how hard it might be to hear. I want to help. We want to help. 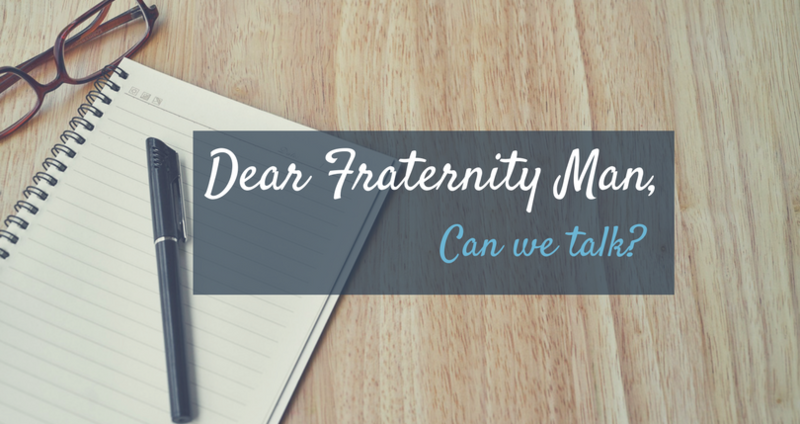 We can’t help however without real conversation about what’s really happening – and understanding what the fraternity experience is really like right now. I’m We’re ready to listen. Can we talk? IFC’s are asking us, “How do we do ‘structured recruitment’ for our fraternities?” It’s an important question right now. If everything were perfect, there would be no need for a “formal recruitment process” for IFCs. Each chapter would work hard to grow year-round, focus on meaningful relationships, help each other succeed, recruit ethically, have high standards, etc. That’s not always the case on every campus, and sometimes the fraternity leaders see a local demand for some structure to their process for myriad reasons. 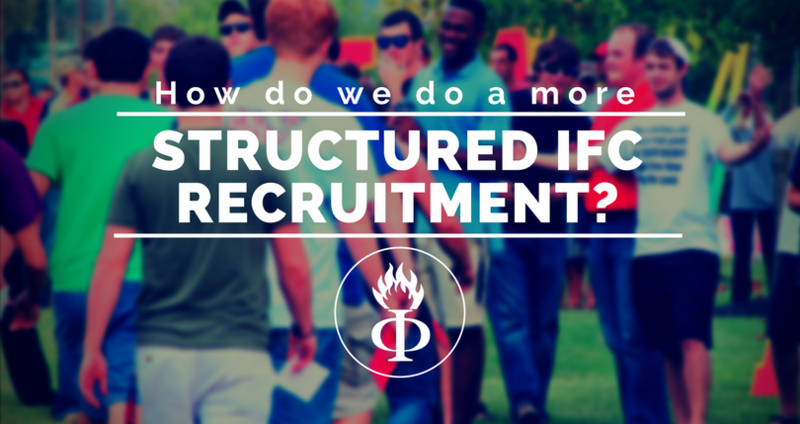 We believe there are two primary reasons right now (at least based on our most recent conversations) that IFCs are wondering about implementing something closer to a “more structured” IFC recruitment process. 1) Health and Safety: Reducing risk in college fraternities starts with changing the way we attract, select, and onboard our newest members. For most campuses with high IFC risk factors, neither the IFC nor the university has any access to or influence over potential members until they’ve already joined. In fact, most of the time neither the IFC nor the university has any record of who attended or participated in any chapter recruitment events or functions. 2) Dwindling Numbers: There are more than a few IFC communities across North America that are experiencing a decline in membership – which is expected to continue over the next five years. Implementing more rules and structure will not solve the problem, but giving the IFC an opportunity to have centralized access to, communication with, and influence over potential members can have a positive effect on overall growth. It should be said that the best and most ideal system is one that is entirely market-driven and allows chapters full autonomy over who they ask to join and how they attract those men. However, we recognize and appreciate local needs, desires, and unique situations (especially given the current atmosphere around fraternities), and we want to help those IFC communities that are seeking more access to and influence over potential members. Below are our basic recommendations for a community considering implementing a more structured, formal IFC recruitment process. First of all, if you think of “rules,” “policies,” “rounds,” or in general, “doing it like Panhellenic,” please don’t. Those things are not a part of any recommendation that we would make. IFC fraternities have a unique culture and set of priorities when it comes to how we do business. “Doing it like Panhellenic” will be an almost certain failure for a thousand reasons. This isn’t about “rules” and “rounds,” it is about a) creating a consistent and excellent recruitment experience for potential members, b) providing our chapters qualified leads, and c) influencing our potential members before they join with clear expectations of membership as well as preparation on how to successfully find a safe, healthy, fulfilling fraternity for them. The first key to a successful structured IFC recruitment is having an infrastructure in place for the IFC to gain access to, communication with, and influence over potential members. The IFC, as the association representing its chapters, needs to be able to communicate with, teach, prepare, learn from, and provide a consistently excellent experience to the potential members in the system. The most obvious way to do this is to do everything in the IFC’s power to REGISTER potential members as early as possible. We recommend using technology like ChapterBuilder‘s council dashboard or CampusDirector, but there are other ways to do this as well. Register all your potential members as early as you can — preferably without making them pay a fee. This way the IFC has a direct line of communication with potential members, and the potential members have an unbiased resource to understand the whole community. To get prospects registered is perhaps the most labor-intensive job the IFC team will take on, and the biggest benefit that that an IFC can provide to its chapters. The IFC should have a plan in place to execute multiple tactics that result in as many potential members signing up for recruitment as possible. This will include marketing tactics and direct recruitment tactics (this is a whole post topic in itself, but this and this are great places to get some ideas). Not only does the IFC want to get as many men registered as possible (and then feed these leads directly to the chapters), but they also want to gather as much qualifying information about each potential member as possible (so chapters have deep profiles to fully understand each prospect). We recommend a full registration form that seeks qualifying data about prospects — a standardized form for this is in development by our team right now. 1. Feed as many prospects to chapters as possible. 2. Know as much about each prospect as possible so that chapters can make informed decisions. 3. Reinforce a consistent, positive, centralized “brand” of Fraternity throughout the process. 4. Prepare all potential members to be educated “buyers” in the recruitment process — knowing what they’re seeking, and aware of both the benefits and the risks of the fraternity experience. Every IFC community should provide a Pre-Member Fraternity Recruitment Orientation event (as early as possible) that each potential member is expected to attend. Fraternity chapter members (or at least leaders) should be in attendance as well. This orientation is a key moment that can a) set high expectations about what it means to be in a fraternity, b) reinforce a positive brand narrative about Fraternity on your campus, and c) provide education to potential members about how to navigate fraternity recruitment on your campus, how to avoid bad chapters, and how to find a chapter that fits their personal values. This orientation shouldn’t be a boring set of chapter PowerPoint presentations. It should be an engaging, entertaining, fun, and educational experience for potential members that prepare them to be successful in joining a fraternity on your campus. Perhaps the most important tactic for the IFC to employ is to provide daily communication to potential members until they’ve formally accepted a bid into their chapter. The IFC should continually provide E-mail and text communication about recruitment schedules, relationship-building opportunities, chapter profiles, IFC community marketing narrative, information about the community, expectations of membership, etc. This daily communication provides the framework upon which the potential members can have a consistent experience, have access to the information that they need about all chapters and the whole community, and be guided through the process as smoothly as possible. Traditionally many IFC communities have a “bid day.” The common bid day includes new members announcing their membership, brothers cheering and congratulating them, and then everyone going out and getting dangerously drunk. Not everywhere, but a lot of places. That’s not an ideal model (obviously). We want to recommend an IFC-run “welcome day” that all new members and new member educators are expected to attend. This is the first day of officially accepting some level of membership in a fraternity. This also marks the first day of the highest risk 6-week period in many college students’ lives. The IFCs that are taking a serious look at how they can impact the health and safety of their communities should consider re-imagining this traditional “bid day,” to be an expectation setting day for the men who have accepted a bid. This can be celebratory, but should set behavioral expectations of safety, conduct, and decorum as the newest members of a prestigious community on campus. If “Welcome Day #1″ ended the “formal recruitment” phase of recruitment, we recommend that the IFC community schedules a second “Welcome Day” or “Bid Day” about 2-3 weeks after the first phase of recruitment. This encourages chapters to continue recruiting, and it also elongates the perceived “joining window” for potential members. This encourages longer relationship building. It can reduce pressure on chapters to bid as fast as possible (and on prospects to accept as fast as possible). Further, it opens another window of opportunity for the IFC to provide value to its chapters by doing a second round of leads generation (immediately following the first phase of recruitment). Campus cultures vary quite a bit when it comes to when primary IFC recruitment activities take place. That said, here’s a very general recommendation for how a formal recruitment, as described above, might play out in a traditional fall semester. IFC registers prospects at summer orientation events. IFC executes social media campaign (and other marketing efforts) to drive registrations on their IFC landing page. IFC promotes a scholarship for first-year men designed to drive leads. IFC offers an on-line “About Fraternity Life” live Q&A as a way to drive leads. All recruitment registrations receive a 3-day series of emails that provide core information about the community, and core information about how to join. IFC assists with freshman move-in, all in an effort to drive recruitment registrations (which are all collected on the IFC’s landing page). IFC conducts 3 major leads-generation efforts during the “week of welcome” on campus. IFC hosts “PRE-RECRUITMENT ORIENTATION” on the first night of classes. Chapters gather recruitment registrations (using the central IFC form on their landing page which auto-populates each chapter’s ChapterBuilder account), builds relationships, hold events, evaluates candidates for ~7-10 days. IFC provides daily e-mails and text messages to all potential members to keep them in the process, encourage them to attend events, reinforce the Fraternity brand, and provide timely education. IFC conducts a second phase of leads generation activities and marketing efforts to generate interest in a second phase of recruitment. Chapters do recruitment as they see fit during this period. IFC leaders have a renewed interest in making sure that the way our newest members are attracted, selected, and onboarded into fraternities is contributing to a healthy, safe, and flourishing fraternal movement. There are a lot of complexities that factor into the policies and processes of our IFC communities. Our companies all value our partnership with both the North-American Interfraternity Conference and its member organizations. We are in continual communication with the NIC to find ways to, of course, honor the rights of our organizations but also address the demand from IFC leaders for access to and influence over potential members for the benefit of the whole community (and for the benefit of those potential members). We are excited to keep working with IFC leaders across North America to help them shape their fraternity recruitment processes to be as effective, as efficient, and as results-producing as possible. As always, we remain committed to helping fraternities build healthy, safe, growing, and thriving chapters. We believe in fraternity now more than ever.